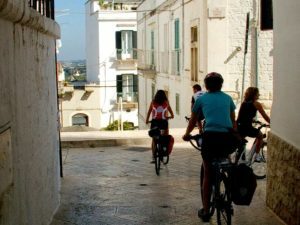 "During your bike tour, away from the traditional circuits, you will experience the authentic side of Puglia, a region still proud to preserve its traditions, folklore and nature: culture is as broad and varied as the region's landscape. It's a trip along the Italy’s heel starting from Locorotondo, continuing through the landscapes of Murgia, all along unique sceneries composed by trulli, pignon and terraces. It goes down the vineyard of Salento with its wine & food excellences and finally arrives Lecce, characterized by Baroque style and local folklore, not to mention the fascinating area of Greek Salento, famous for its traditional dances and its tarantulas music." Upon your arrival, the white Locorotondo welcomes the guest from the top of its terrace, one of the most beautiful of Murgian area. From its lookout it is possible to fully admire breathtaking views of its territory from above: a collage of small vineyards contoured by dry-stone walls, patches of Mediterranean woods and silvery olive groves that surround ancient farms and thousands of trulli dotted in the districts. The small old town of Locorotondo is enclosed in its magical atmosphere, between dream and reality: the washed-out colour of its building wraps every angle and its baroque architecture adorned with stone clear local enhances the intense colours of flowering balconies. This area is also famous for orecchiette pasta, the most well know fresh past of Apulian cuisine, and for its centuries-old viticultural local tradition which has encouraged the production of white of high quality wines, such as the famous White Locorotondo Doc: fresh, light, dry, delicate bouquet, ideal for appetizers, excellent with fish and seafood. 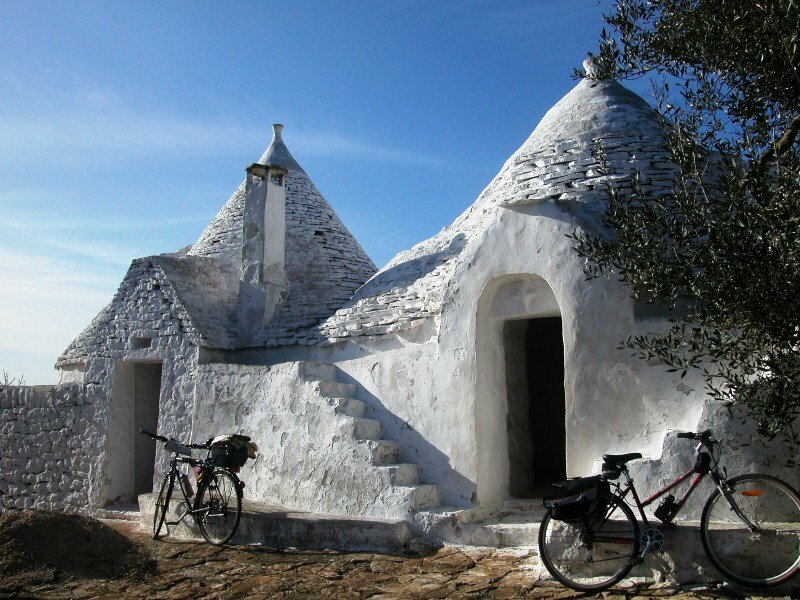 Cycling about 52 Km This round excursion touches the magnificent Itria Valley, the heart of the Murgia of Trulli. 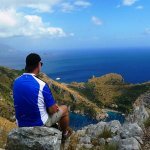 Cisternino, Ceglie, Martina Franca, the villages that overlook the valley, are positioned over gently sloping hills with natural viewpoints. The alluring and harmonious landscape is lined by old rural trails enclosed by the typical dry stone walls, along the trails are present small and precious stone churches and buildings. Riding up and down the rolling hills the cyclist meets Trullo Soprano, in the district Pascarosa, a wonderful model of typical local structural design, one of the most majestic and monumental trullo of the entire Murgia. Here it is possible to stop by the typical farm and taste the delightful dairy product such as mozzarella cheese and a variety of different soft cheeses produced only in this area. Then it is possible to get lost in alleys, courtyards, arches of historic center of Cisternino, a beautiful little village famous for woodand stone handcrafts. To not be missed, Ceglie, capital of gastronomy, where there are numerous restaurants, wine cellars and taverns. Recognized Slow Food Presidium for its biscuits. 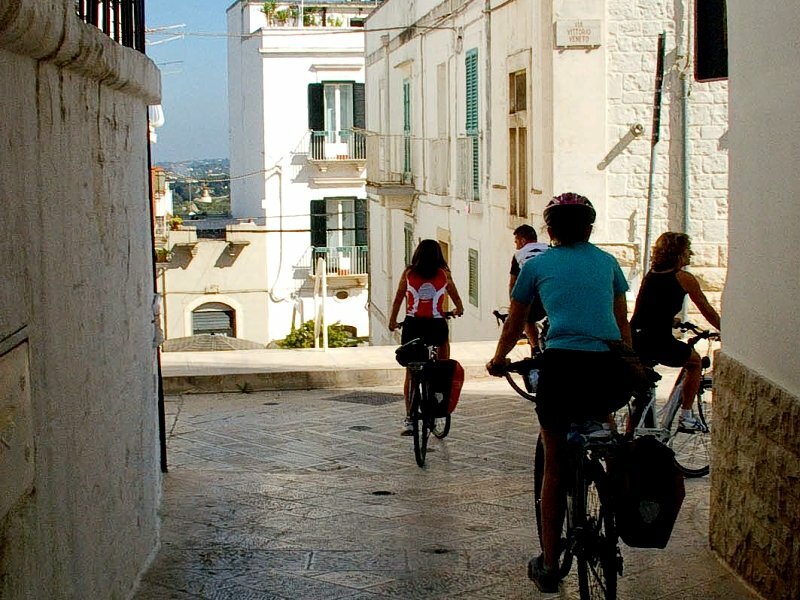 The rides continues touching Martina Franca with its striking Baroque architecture that is possible to admire on the facades of its churches and its homes; home of the locally produced wine Martina Franca doc, and typical capocollo and salami. 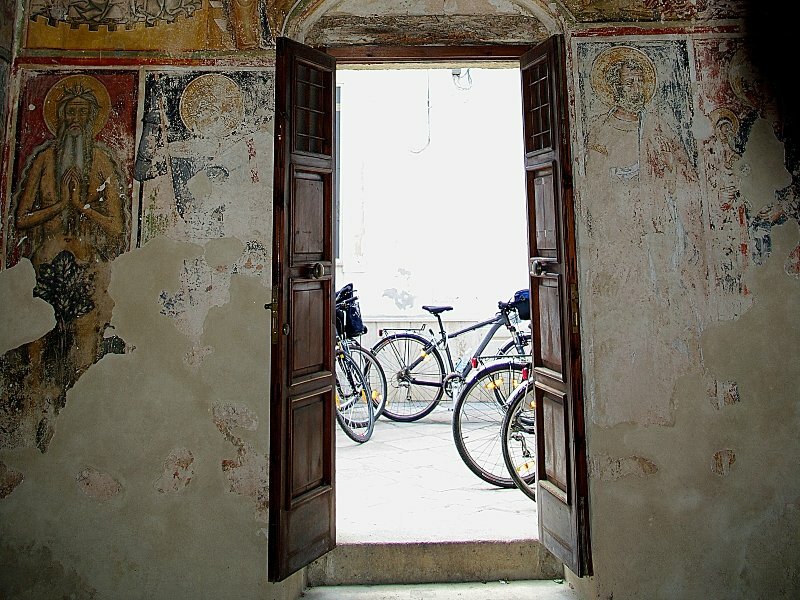 Cycling about 50 Km Caves, trullis, farms and churches built using typical local style and clear stones ... This and much more waits for the cyclist visiting Castellana, a town nestled in the green of the olive trees and known for the magical atmosphere of its underground caves. The journey goes on through Putignano, a bustling town, rich in cultural traditions and monuments. The ride goes through the historic center of the village famous all over Italy for its Carnival, following the traces of “Farinella” (typical local food product and name of the town mask). The trip continues along the forests of Fragni , dry stone walls take you to the fascinating Barsento Abbey, with the annexed farm that was once a convent, which lies in a dominant position on a hill overlooking the "Canale di Pirro," a karst depression characterized by woods, vineyards and pastures. Noci enchants the traveler in the alleys of the old town heading into the gnostre, typical squares often sets for festivals and cultural events. 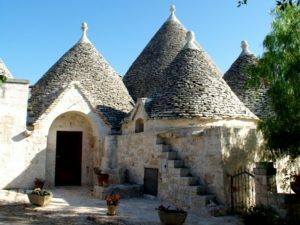 Finally Alberobello, a charming UNESCO World Cultural Heritage site: known throughout the world for its trullis, the typical buildings that dot the rolling, lush hills of the area. It is the only town in Puglia with an historic center composed by a multitude of trullis. The places deserves a town walk to observe the coned roofs, embellished with decorations of various shapes, depicting religious or zodiac symbols. Castellana Grotte with its caves, considered the most important complex of caves in Italy and Europe here it is possible rock formation composed by stalagmite and stalactites including the White Cave, the Cave of the Altar, the Cave of the Dome and the Passage of the Nativity. In Putignano there is the opportunity to visit the Borgo Antico, where palaces and ancient monasteries are disposed in typically medieval urban structure characterized by a main square, Piazza Plebiscito, which is overlooked by the Mother Church, the Palace of the Bailiff (base in the Middle Ages, of the Order of the Knights of Malta) and the Seggio (the house of city government, currently occupied by the Pro Loco) with clock and coat of arms on the facade. 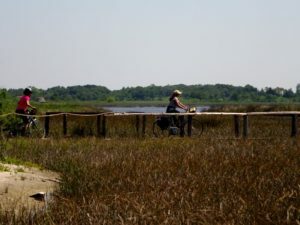 Cycling About 62 Km Today a nice & pleasant ride takes right down to the plains of Salento, in the land of Messapians. After having reached Ostuni, the “white city”, whose appeal lies in the characteristic washed-out walls of all houses in the old town, the track heads toward the rolling hills of the Murgia turning gently and gradually into the vast plain of Upper Salento, the land that the great Emperor Frederick II called “Filia Solis”: the daughter of the sun. Here the countryside is characterized by orchards, vast olive groves, vineyards and crops. Most of villages often hide in their central part baroque and medieval treasures, unexpected beauties heritage of prestigious architectural history. San Michele Salentino, a small rural village, produces an unique gastronomic delights dating back the olden times: “figs with almonds”. 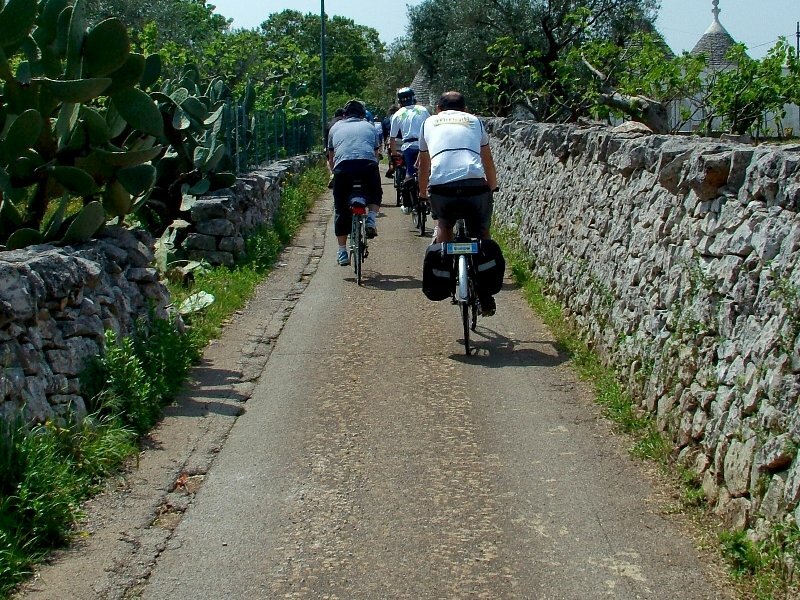 From Latiano, home of a rural museum, the ride takes to Mesagne pedaling along the Via Appia, the most important Roman road also called the “Regina Viarum” . This town represents an interesting example of Apulian Baroque in this province. Its charming heart shaped old urban centre is surrounded by massive walls completed by the imposing Norman-Swabian castle which become through centuries a skillful blend between a sophisticated military fortress and a renaissance residence. 1st option - Cycling about 55 Km The ride today takes through a interesting tour into the south-east area of the region, along fascinating ancient pilgrims trails, retracing some section of the old Via Francigena. From Mesagne to Lecce, passing Casalabate, Santa Maria di Cerrate and Santa Maria d'Aurio. Here the silence accompanies the rider through majestic olive trees that protect the pace and provide shaded shelter during stops. Passing by the farms along the way: some fortified with high towers and defence walls, some others more bucolic and rustic. The highlights of the day are the Abbey of Cerrate, which in the past was an important place of worship, nowadays in its mill has been set up a Museum of Arts & Popular Traditions of Salento, then the elegant Romanesque church of Santa Maria of Aurio. From here you can easily reach the city of Lecce, a real gem, whose architectural style and history that never cease to amaze visitors. A stroll through the historic center of Lecce gives the opportunity to admire its churches and its cathedral, a triumph of Baroque style with its refined and noble palaces along the shopping streets. The gastronomy Lecce offers the pasticciotto, sweet pastry filled with cream and cherry; the rustico, salty baked bread with mozzarella and tomato, the pizzo, a kind of bread with olives, onions and tomatoes. 2nd option - Cycling about 41 Km Today the ride combines the pleasure of discovering art and culture treasures with the joy of wine tasting. Starting from Mesagne the ride goes towards the Limitone of the Greeks reaching the lands of Primitivo, Negroamaro and Malvasia, grapes grown almost exclusively in Puglia, land of excellent world prized wines. The Limitone of the Greeks was a legendary defensive line built by the Byzantines against the Lombards, later it was used as a shortcut to reach Lecce instead of using the Via Appia. There are many sites that can be seen on this stretch: rock-hewn churches, cemeteries, hot springs, Roman villas, fortified farms, all nestled in a picturesque rural landscape made of olive trees and vineyards that starting from September are rich in heady scents making very pleasant the ride to city of Lecce a small jewel of architecture and history that will never cease to amaze you. Do not miss The Parco del Negroamaro: all villages inside the park are part of a territory of excellence for the production of wines. In each location you will find a wine cellar where you can stop by and taste their products. 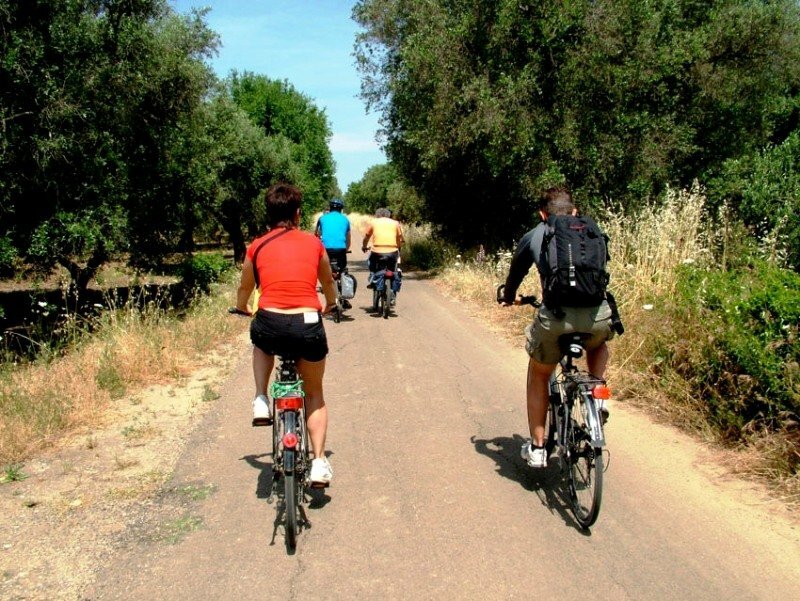 Cycling about 55 Km Kalòs ìrtate stin Greek Salento, Welcome to the Greek Salento. 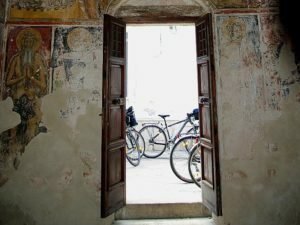 A gorgeous bike trail takes through the places where the Greek-Byzantine influence is very strong and most of the local speak a dialect known as neo-greek, gricanico or griko. An intriguing mix of language, history, culture, traditions and folk music, ancient settlements, dolmens, menhirs, crypts, oil mills, court houses, churches. Each of these towns tells a different story with common characteristics: places and lives often pristine, bearer of authentic values, such as hospitality, that arriving from Greece spread through the whole Salento crossing time and space. And above all the importance in the local cuture of music and dance of the tarantula pinch, a sensual dance of courtship, made of slow movements, close looks, fascinating rotations during which the woman expresses her femininity. ωραία βόλτα! Enjoy your ride! 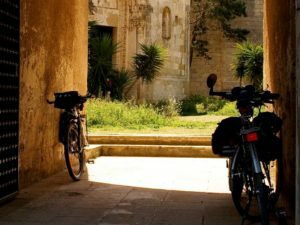 Cycling About 35 Km Today the ride through history and nature, starting from Lecce, continues along quiet and calm minor roads reaching Acaya; the only example of intact fortified medieval town in the entire Souther Italy. The access to the villages is possible through the trapezium shaped portal that opens along the walls of the castle. The town has a distinctive road system that dates back 1500, six main roads, parallel to each other, from south to north, all have the same width of 4 meters, equal distance of 17 meters and almost all measure the same length. After visiting Acaya the tour continues to the remnant of the ancient coastal swap on the Adriatic. 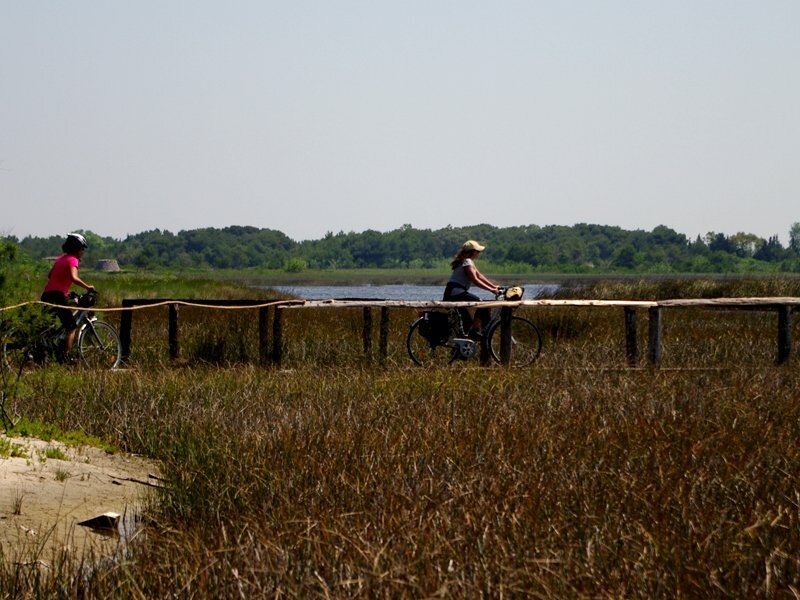 The Park of Gesine is without doubt one of most important wetland in Italy, It still keeps intact the original natural beauty. The two ponds fed by rainwater, are separated from the sea by a strip of sand dunes and here with some luck it is possible to admire the great egret and the heron. After a great day the bike tour ends in Lecce.